divine anger and transcendental love. The magnificent prowess of Lord Nrsimha overwhelms the demoniac king Hiranyakasipu. Although the Supreme Lord is not obliged to personally come and fight in hand-to-hand combat to defend His own interests, still He enjoys the sport of a good fight. He is the original person, and all personal attributes originate in Him. Thus chivalry and anger are present in the Supreme Lord’s personality, and these qualities are seen as He chastises Hiranyakasipu. Ferocious beauty. Red eyes glare out from a fearsome visage that writhes with rage. The form is massive. The powerful arms thrash in all directions. The being appears to be half man and half lion, with a huge many-headed serpent rising and coiling behind Him—a gorgeous yet forbidding halo. 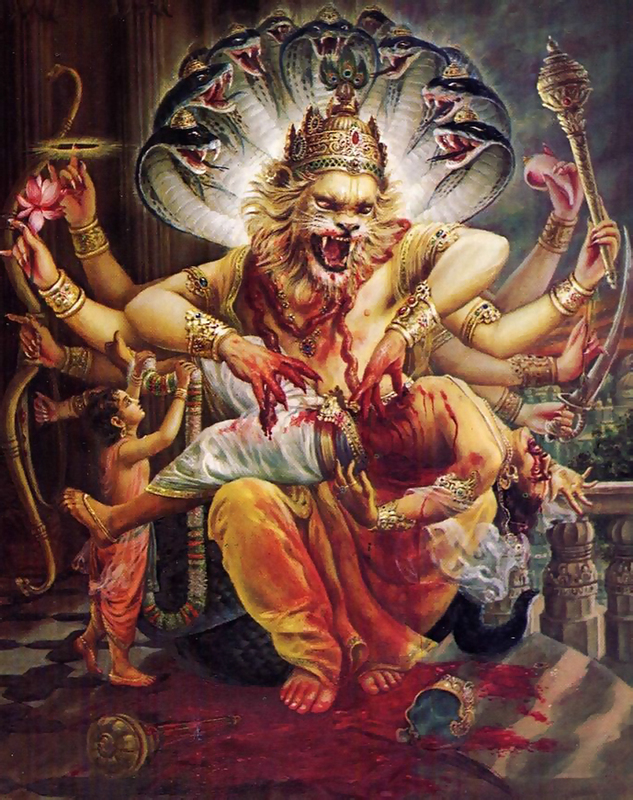 He is Nrsimha, attacking and killing the demoniac king Hiranyakasipu. Blood splatters, and Nrsimha, like a lion at his kill, roars victorious, His golden mane effulgent about His regal head. His anger is terrible, yet at His side stands a delicate young boy with a radiant smile. He is offering Lord Nrsimha a garland of flowers. As a newcomer to a Hare Krsna temple, you might have been surprised to see a picture of this scene prominently displayed in the temple room or on the altar. Who is Nrsimha, and what is His connection with the peace-loving, vegetarian Hare Krsnas? Remarkably, Lord Nrsimha (“half man, half lion”) is one of the most beloved of incarnations. His special pastime is to protect all souls surrendered to Him, thus demonstrating the extraordinary bond between the Supreme Lord and His dear devotees. Nondifferent from the blackish-blue cowherd boy Krsna, who charmed the gentle residents of Vrndavana Village five thousand years ago, Lord Nrsimha proves His pure devotee can never be vanquished. Lord Nrsimha’s appearance is one of the most dramatic episodes in history, recorded exclusively and explicitly in the Vedic literature, especially in Srimad-Bhagavatam. The story takes place in a former age, many thousands of years ago. A powerful atheist named Hiranyakasipu desired immortality within this material world—a favorite pursuit of those unable to imagine an existence beyond the material realm. Hiranyakasipu longed only for wealth, power, and sensory pleasure. The very name Hiranyakasipu refers to one who is fond of gold and comfortable beds. Since material pleasures can be had only as long as one remains bound within the physical body, the natural calculation of a materialist like Hiranyakasipu would be to extend the life of the body for as long as possible. It was for such “immortality” that Hiranyakasipu hankered. To achieve his end, he performed excruciating austerities for 36,000 years, plotting to win the favor and benediction of Lord Brahma, chief of the demigods. So grievous were his austerities that the entire universe was disturbed. Finally, the demigods begged Lord Brahma to terminate Hiranyakasipu’s terrible penances. Lord Brahma is a very powerful agent of the Supreme Lord entrusted with the responsibility of creating the entire material cosmos. He came before Hiranyakasipu, knowing his strong desire for immortality, yet he was unable to grant the benediction. Although Lord Brahma lives for many millions of years—from creation to annihilation—he also dies. Thus he was unable to give Hiranyakasipu that which he himself did not possess. Cunningly, Hiranyakasipu then made the following request: He asked that he not be killed with any weapon, indoors or outdoors, in the daytime or at night. He also asked that he not be killed on the land or in the air, or by any beast or human being, living or nonliving. After securing these benedictions from Lord Brahma, Hiranyakasipu felt confident that he had indeed achieved a kind of immortality. Who could stop him now? Hiranyakasipu was fueled by an intense hatred for the Supreme Lord. Formerly, when the Lord in His boar incarnation had killed Hiranyakasipu’s demoniac brother, Hiranyaksa, Hiranyakasipu had vowed to avenge his brother’s death. Thus he had set about conquering the universe with savage determination. He defeated the rulers of each planet, forcing great demigods to bow down and worship him. His reign was oppressive and severe, and the people lived in fear of this tyrant no one could kill. In our modern age we have some experience with dictators who create agony for their subjects, yet none has been so monstrous as Hiranyakasipu. He dominated the universe, holding it in his tyrannical grip. The helpless people prayed to the Lord for relief. Hiranyakasipu had four sons, and of these the most wonderful was Prahlada. While in the womb of his mother, Prahlada had heard the sage Narada speaking the transcendental philosophy of Krsna consciousness. 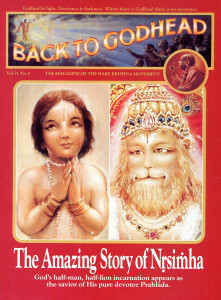 Thus he had become a spotlessly pure devotee of Lord Krsna. His character was ideal; his qualities were as exalted as his father’s were abominable. Even as a child he was unattached to frivolity and sensual comforts, preferring to meditate on God’s glorious activities. Hiranyakasipu was very fond of Prahlada. This affection diminished, however, when Hiranyakasipu learned that Prahlada was instructing his schoolmates in devotional service to Lord Krsna. Hiranyakasipu called his son and, placing him on his lap, requested him to tell what he was learning in school. Prahlada serenely replied that he was understanding the folly of materialistic pursuits and the need for intelligent persons to devote their time to serving the Supreme Lord. This reply infuriated Hiranyakasipu, who ordered that his son be killed. The order, however, proved exceedingly difficult to execute. Prahlada was thrown beneath the feet of elephants, attacked with deadly weapons, and hurled from a mountain. He was tortured and poisoned. Yet despite these attempts on his life, he remained unhurt. Throughout all his travails he simply meditated on Lord Krsna, who kept him from harm. Hiranyakasipu could not bear this. Believing himself the ultimate controller of the universe, he could not understand why the child simply could not be killed. He grew fearful: Who was more powerful than himself? Who was supplying this child with such strength? Determined to silence Prahlada once and for all, Hiranyakasipu decided to kill him with his own hands. Hiranyakasipu disturbed the entire universe with his severe austerities. He stood poised on the tips of his toes with his arms up-raised. And in this excruciating position he remained for a full 36,000 years, even while ants crawled over his body and ate his flesh. By dint of these austerities he became very powerful, causing fire to emanate from his head. While Prahlada stood submissively, his seething father rebuked him harshly. He demanded to know the source of his son’s mysterious strength. Prahlada replied that the source of his strength was the same as the source of Hiranyakasipu’s strength: the Supreme Lord, Krsna. “My dear father,” Prahlada advised humbly, “please give up your demoniac mentality. Do not discriminate in your heart between enemies and friends; make your mind equipoised toward everyone. Except for the uncontrolled and misguided mind, there is no enemy in this world. When one sees everyone on the platform of equality, one comes to the platform of worshiping God perfectly” (Bhag. 7.8.9). These words served only to further outrage Hiranyakasipu. In anger, he demanded to see the Supreme Being described by his son. “But where is He?” Hiranyakasipu raged. “If He is everywhere, then why is He not present before me in this pillar? Because you are speaking so much nonsense, I shall now sever your head from your body. Now let me see your most worshipable God come to protect you. I want to see it” (Bhag. 7.8.12-13). The unfortunate king then struck a marble pillar with his fist. A terrible noise came from deep within the pillar, and the whole universe filled with fear at the tumultuous sound. As the pillar exploded with tremendous force, the entire assembly hall suddenly filled with the immense divine form of Lord Nrsimha. Lord Nrsimha was infuriated, having witnessed Hiranyakasipu’s cruelty toward Prahlada, and now His fierce eyes searched the crowd for the object of His anger. 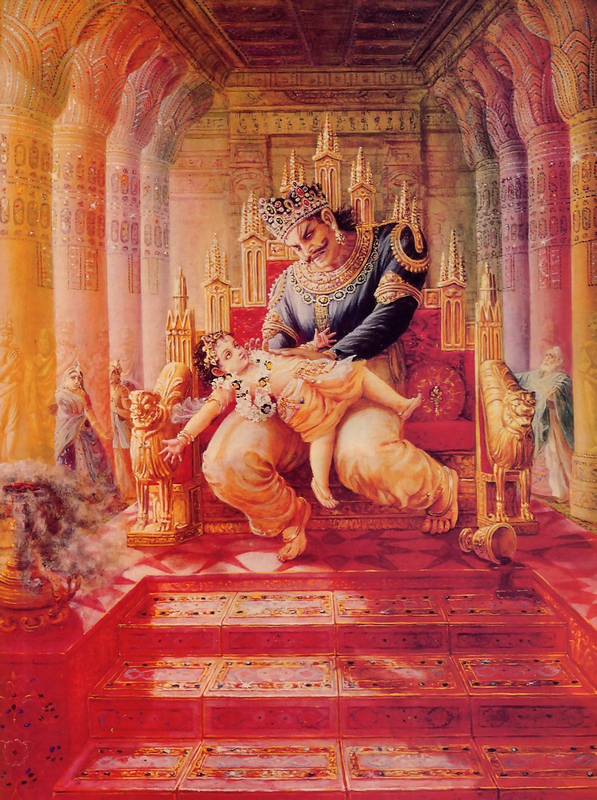 When the saintly child Prahlada proclaimed his desire 10 exclusively worship the Supreme Lord, his atheistic father reacted by violently shoving the boy from his lap. Hiranyakasipu was only interested in gaining power and glory for him self; thus he could not tolerate his son’s devotion to God. Out of intense envy, Hiranyakasipu plotted to kill him. Hiranyakasipu foolishly thought he would be able to defeat Lord Nrsimha, just as he had defeated all his other opponents. He battled fiercely against the Lord, who, for the sake of sport, allowed him the honor of extended combat. Yet Hiranyakasipu, although the most powerful creature in the universe, was simply a toy for the mighty Nrsimha. While the demigods anxiously watched, the Lord displayed His magnificent prowess in battle. Finally, having tired of the antics of His puny adversary, He lifted Hiranyakasipu onto His lap and, ripping open his abdomen with His nails, disemboweled the demon king. Thus Lord Nrsimha finally killed Hiranyakasipu—and in such a way that all the benedictions of Lord Brahma were left intact. 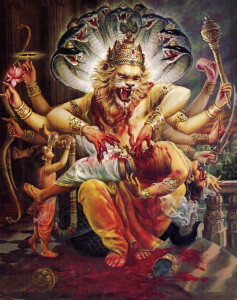 Hiranyakasipu was killed not by any human being nor by any beast, but by the Supreme Lord Himself, half human, half beast. Lord Nrsimha killed Hiranyakasipu on His lap, which was neither land nor sky. He killed him in the doorway of the assembly hall, which was neither indoors nor outdoors. He killed him at twilight, which was neither day nor night. And He killed him not with any weapon but with His own nails. Although Lord Krsna was not bound to honor the benedictions awarded to Hiranyakasipu, He still kept them because Brahma is His devotee. Krsna takes great pride in upholding His devotees’ promises. Unafraid of the ferocious Lord Nrsimha, Prahlada approaches the Lord to garland Him. Prahlada understood that Hiranyakasipu had brought about his own fate by his defiance of the Lord’s omnipotence. Prahlada then requested that his father be liberated from further suffering. After Hiranyakasipu’s death, Lord Nrsimha, who had so easily killed the most feared tyrant in the universe, continued to roar and rage, terrifying everyone. Everyone, that is, except Prahlada. 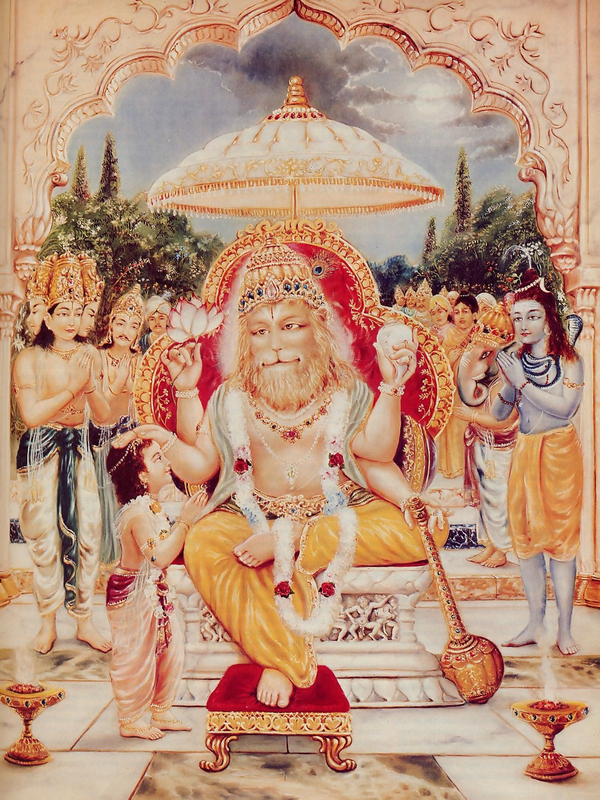 Prahlada simply saw Nrsimha as his worshipable Lord, and he eagerly approached Him with a garland of flowers. Lord Nrsimha was deeply pleased with the faithful Prahlada, and He wanted to award the boy whatever boon he desired. Prahlada, however, said that he was already completely satisfied in his meditation on the Lord. But, out of compassion, he thought of the welfare of his father. He requested Lord Nrsimha to please liberate Hiranyakasipu from the torment of his demoniac desires. Child abuse of the most severe type. 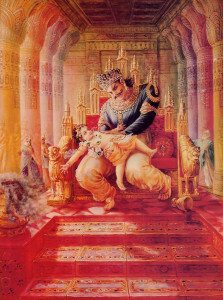 Hiranyakasipu attempted to kill his own son, yet the boy was saved by the will of the Supreme Lord. 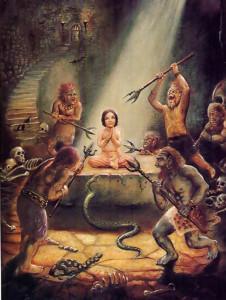 Although Prahlada was innocent of any wrongdoing, he never became angry or bitter, but simply prayed to Lord Krsna in all circumstances. The Supreme Lord, Nrsimha, assured him: “My dear Prahlada, O pure one, O great saintly person, your father has been purified along with twenty-one forefathers in your family. Because you were born in this family, the entire dynasty has been purified. Whenever and wherever there are peaceful, equipoised devotees who are well-behaved and decorated with all good qualities, that place and the dynasties there, even if condemned, are purified” (Bhag. 7.10.18-19). 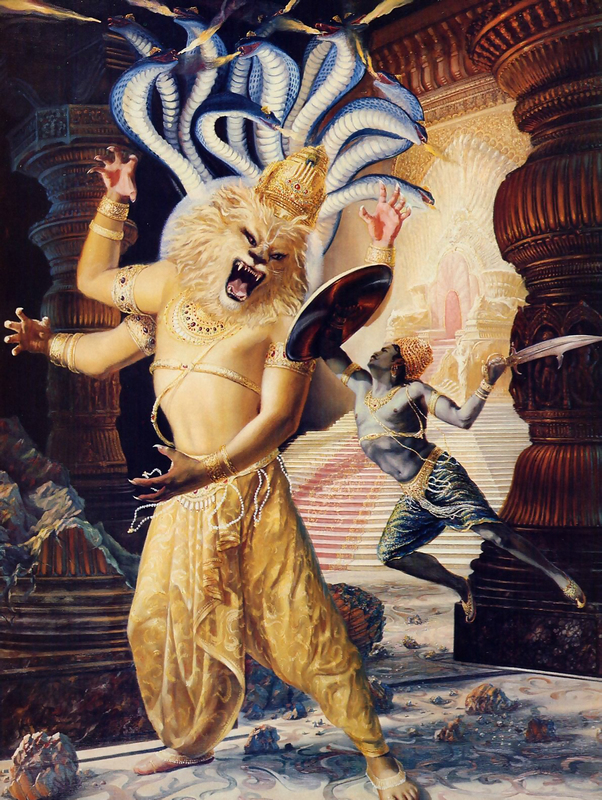 The pastime of Nrsimha and Prahlada demonstrates the intense bond of love between Krsna and His devotees. The Lord protects devotees who are unflinching in their service and meditation.